On Friday, we reported on American Airline CEO Tom Horton’s golden parachute in the merger agreement between American and US Airways. American is asking the court overseeing its bankruptcy to approve the merger agreement, which includes a letter agreement between American and Horton. The letter agreement provides that Horton’s employment with American will be terminated at the time of the merger, and – so long as he agrees to release American and US Airways from any claims – he will be paid severance totaling nearly $20 million in cash and stock. Why would any company agree to such a thing? According to American, its agreement with Horton is “in recognition of [his] efforts in leading [American’s] restructuring and his role in enhancing the value of [American] and overseeing the evaluation and assessment of potential strategic alternatives that culminated in the Merger.” In other words, to compensate him for helping to make possible a good merger and then getting out of the way. The new company created by the merger can only have one CEO, and it is best for the new company not to be distracted by disputes with former executives of the old company. American’s rationale for its agreement with Horton is similar to the rationale that is often given for including golden parachute provisions in agreements between top executives and companies entered into at the outset of the employment relationship. Companies contend that it is in their interest that the judgment of their top executives not be clouded by their own self-interest when merger and acquisition partners come knocking. 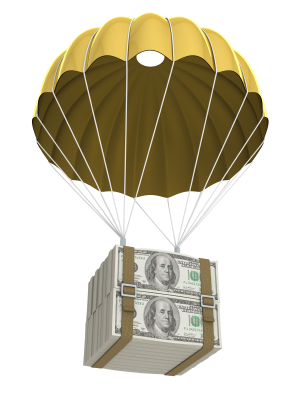 If a golden parachute assures the CEO of a soft landing at the conclusion of any company takeover, then the CEO will prioritize shareholders’ interests when evaluating a deal that may put the CEO out of a job. Of course, the CEO is supposed to do that anyway as a company fiduciary. Companies also argue that they cannot attract top executive talent unless they can compete with other companies offering attractive severance benefits, especially in industries where mergers are common. In recent years, scholars have questioned whether the rationale has empirical basis. And, the extent of compensation secured by golden parachute provisions apparently has decreased. But, as the agreement between American and Horton shows, as well as similar news about gaming machine maker WMS Industries on the verge of an acquisition, golden parachutes are not going anywhere. Stay tuned for a review of the typical terms of a golden parachute provision (also known as a change-in-control provision) in an employment agreement.